Spring is one of the best time for life and this season encourage you to live your life with full of it. Also, spring is the time of cleaning for most of the people and they use this time to clean their house as part of their renovation. Well, that is a good thing to do and there is nothing wrong if people are cleaning their house during this lovely time of the year. But when they do the cleaning work in Spring time, then they make some mistakes also and these spring cleaning mistakes can lead them to some serious problems or health issues. But if you know about these spring cleaning mistakes, then you can easily avoid those mistakes and then you can get the best result also from your cleaning work. To help you more in it, following are 5 spring cleaning mistakes that you should avoid during your spring cleaning work. Cleaning your home in an unorganized manner: If you love to keep your home or room in an untidy manner, then that’s your choice and we will not ask you to change your habit of living. But if you will try to do the cleaning work in an unorganized manner, then that would be one of the biggest spring cleaning mistakes that you would do. When you do the spring cleaning work, then make sure you plan for it, you get the right help, you arrange all the tools and replacement material and you follow the proper steps for that. When you will do that, then you will not get any kind of trouble in your spring cleaning work. Doing all the work by yourself: Many times people think they can do all the spring cleaning work by themselves and that’s why they do not get any help from any other person. Well, that is another very common spring cleaning mistakes that many people do and they face serious problems with it. This kind of cleaning work requires a lot of work and if you take others help then you finish the work quickly and you get better quality also. So, make sure you do not make the same mistake and when you do the spring cleaning work, then you take help of your friends or you call some professionals for that. Doing the work without the right kind of equipments: If you do not have the right kind of equipments, then you can invest a lot of time and hard work in the cleaning process and then also you will get only poor result from that. That’s why, it is essential that before starting the cleaning work you get all the necessary equipments for cleaning work. Talking about these equipments this list is very long, but make sure you get micro fiber cloths, extension wands, steam tool and vacuum cleaner so you can clean all the hard to reach places also easily and very effectively. Not cleaning in a proper manner: At first step I said about cleaning without proper planning is one of the biggest spring cleaning mistakes and I can say the same thing if you do not follow a proper method for cleaning. So, it is suggested that when you start cleaning your home for spring, then make sure you follow a step by step process for that. Also, when you do the cleaning work, then first give more importance to cleaning of those parts that are bigger, more visible and crucial for cleaning of your home. Using same old cloths again: Many times, people try to save money and that’s why they use same cloth again after cleaning work is done. By doing that they make one of the top spring cleaning mistakes and because of that mistake they do not get desired health benefits also with it. So, if your cloths such as bed sheets or pillow covers are very new, then you can use it. But if these clothes are older than one year, then it is a good idea that you replace all the cloths with new one. This simple change will not only give you the feeling of freshness, but it will help you get much better result also from your spring cleaning work. Spring cleaning is an important process for most homeowners today. This process can help you clean your home from any unwanted things and materials. This procedure is recommended for all homeowners who want to keep their rooms as clean as possible. However, you need to avoid some common mistakes during the spring cleaning process. These mistakes can cause a lot of problems in your home today. It is not difficult to avoid some of these mistakes, especially when you want to clean your home completely. This is the first mistake that you may do in your daily life. Many people don’t have clear cleaning list, so they don’t know on how they can clean all rooms in their properties easily. It is recommended that you create a good cleaning list, especially if you want to keep your home as clean as possible. It is not difficult to create this type of cleaning list. You can simply create a list of several rooms in your home. Don’t forget to add list of your cleaning supplies, tools, equipment, in order to make you clean your home easily. This cleaning list is very useful to guide you during the spring cleaning process. This tip is very useful for you who are busy with your daily activities. When you want to have clean home, you should avoid this mistake. You should never clean everything by yourself. It is recommended that you hire a professional spring cleaning service. This type of service can save a lot of your time, energy, and money, especially if you want to clean your home regularly. Regular spring cleaning is very useful to help you remove unwanted materials or things from your home completely. This service is usually done by professional cleaners. They know how to clean any rooms and properties quickly. They are ready to help you keep your home as clean as possible. It is one of the most common mistakes for most people in Singapore. Many people don’t compare all available cleaning companies, especially when they want to clean their homes and rooms completely. When you want to choose the best cleaning service, you should compare several cleaning companies. Don’t forget to compare some of their features, services, packages, and many other things, so you can select your favorite one easily. You can contact some cleaning service companies before you choose the best cleaning service for yourself. You shoul find some available cleaning companies from several resources, such as websites, blogs, directories, and some other places. This is another mistake that people usually do in Singapore. Some of them don’t read reviews from other customers before they choose their favorite service today. If you want to clean your home completely, you should read some customers’ reviews that are available in many resources. These reviews can help you read some cons and pros from certain companies. You can compare some available companies easily when you read these reviews. Good companies usually have many good and positive reviews from other clients. Reputable companies tend to provide high quality and outstanding service performance for all customers. It is a great time to read some available reviews, so you can select the best cleaning service in Singapore easily. If you want to keep your home as clean as possible, you should never do one time spring cleaning. It is recommended that you clean your home regularly. When it is necessary, you can create a good schedule for managing your spring cleaning service schedule. Regular cleaning is very useful to clear all unnecessary materials, such as dust, pollen, dirt, and many other unwanted materials from your home completely. Many experts recommend their client to do regular spring cleaning at least 1 – 2 times a month. Some people are unaware with this mistake. When you want to clean your home safely, you should check all cleaning supplies carefully. Make sure that you read all instructions or information on the packaging. This step is very useful to help you clean your property easily. It is a good idea for you to choose the best cleaning supplies that are made from high quality and safe materials. You can also read some instructions that are available on the packaging of the cleaning supplies. When you read these instructions, you should get all benefits from these cleaning tools, supplies, or other products. You can also contact your favorite cleaning service company to ask about the best cleaning supplies. If you only have small budget for cleaning your home, you should consider following this simple tip. You need to manage your budget properly, so you can avoid spending too much money for your spring cleaning. Managing your budget can help you save your money for cleaning your own home. When it is necessary, you can contact several cleaning service companies for comparing some available cleaning services. Don’t forget to ask for the free quotation from these companies. Most companies are ready to give you free quote. This quote may include all important details for the spring cleaning procedure, including labor cost, material cost, and many other costs. They are some common mistakes that you should avoid, especially if you want to clean your home regularly. It is not difficult to avoid some of these mistakes, so you can have clean home easily. 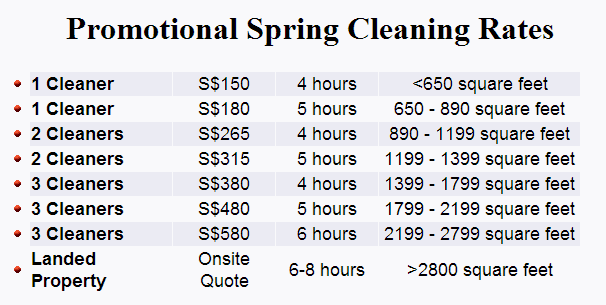 There are some professional and reliable spring cleaning service companies in Singapore. You need to choose the best service that has good reputation on the market these days. House Cleaner Singapore is ready to help you clean your properties. You can rely on the service quality and reputation of this company. Contact this company today for asking about all available spring cleaning service packages. Here are some tips that I am going share to let you know that for spring cleaning it can be done swift and not too rushing. Always remember to create a list of all the stuffs you would like to do. Always do with a room or an area of your home once at a time and write down what you would like to finish cleaning in that room at the end of the day. Through this way, you can achieve your aims gradually and it will not be overwhelming. Donate away your usable old items to charity organisation to space out your home and help to clean out your clutter. Always give to the less fortunate. You will reap what you sow. Since is a spring cleaning, get your family members in assisting you to do the cleaning tasks. You will feel more committed and fun in doing the chores when your family members do their contribution. With the assistance from them, the chores will finish smoothly and easier. Always take note that items are too big or heavy to be carried by one man force, do remember to seek for assistance too. Spring cleaning it may seem to be tedious and tired chores to do thus make it fun by creating it as a party. Whip up some nice snacks for eating and on some hip and rock music and engage your whole family to participate. Delicate the tasks to your family members as according to your cleaning list. This is a wonderful idea to bond your family togetherness and also to get your motive done for the cleaning. To conclude, those above tips will more or less help you to overcome your spring cleaning tasks of your residence for new start of the year. Always do remember do your spring cleaning as early as possible before your festival, so you would not rush through at the last minute.